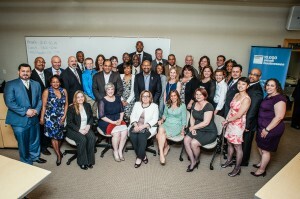 Emily Morgan Graduates from Goldman Sachs 10kSB Program! 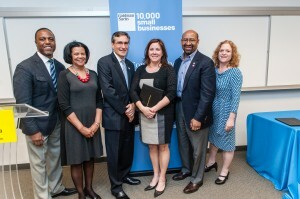 Emily Morgan, owner of Delegate Solutions, was among the 28 graduates of the Goldman Sachs 10,000 Small Businesses-Greater Philadelphia program in April. The business owners have spent 12 weeks - roughly 100 class hours - at the Main Campus of Community College of Philadelphia actively engaged in an entrepreneurial business curriculum designed by Babson College and delivered by the community college faculty. The curriculum covered all elements of running one’s business, from money and metrics to marketing and sales. The program also included one-on-one business advising, financial statement workshops and advice from top law firms and Goldman Sachs professionals. 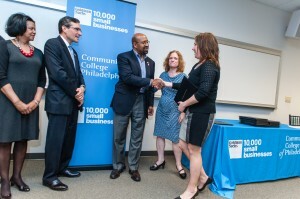 Applications for 10,000 Small Businesses are accepted on a rolling basis at Community College of Philadelphia, with June 9, 2014 as the deadline to apply for the next cohort. The program is open to business owners from across the Greater Philadelphia region. Applications may be downloaded at www.ccp.edu/10KSB.